This divine picture book by Katie Cleminson captures everything I love about books. 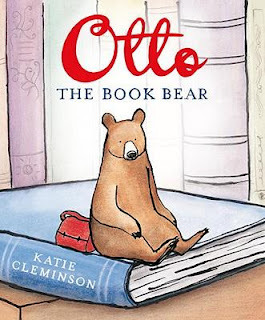 It is the story of Otto, a book bear, who lives ‘in a book on a shelf in a house’ and is ‘at his happiest when children read his book’. But Otto has a special secret. When no-one is looking he can walk out of his book and go exploring! All is well until one sad day when Otto finds himself left behind! He misses his comfy book and discovers that the big world outside his house is scary and overwhelming. Where will he go? Is he the only one of his kind? Will he ever find his book again? Katie Cleminson manages to create a beautiful old world feeling with her illustrations. The strong lines and understated colours capture the emotion of the story and keep the focus on Otto and his longing to find that feeling of safety again. This book is about overcoming fear and finding belonging and, most importantly, about books and how warm and safe they can make you feel. A must for every lover of books, libraries and the imagination. This book is a favourite in my household.